Web developers are always interested in learning more and more programming tools and languages to make themselves the full stack developers. You are front end developer or might be a back end developer, you can’t get yourself satisfied with one or two programming languages until you get the knowledge of different languages. It is important to understand the complete process of web development to have a comprehensive knowledge of new tools and trends. If you are learning different programming languages you will be able to be a full stack developer and this skill will lead you towards the height of your career. To be a full stack developer will improve your experience and enhance your confidence. 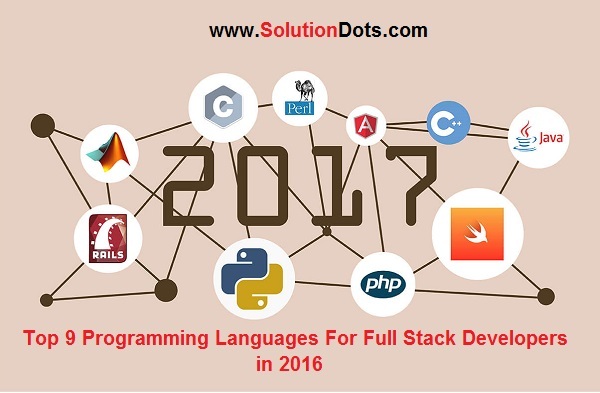 We have mentioned the top 9 programming languages that you need to learn to be a full stack developers in 2016. Java is a well-known programming language that could be used for different web applications. It allows the developers to write code dynamically and could also be used for the development of native android applications. It is quite easy to learn java because it is an object oriented language and helps the system to be more flexible and compatible. PHP (Hypertext Preprocessor) is a server-side scripting language used by different web developers for creating dynamic websites. It has the ability to enhance the appearance and functionality of websites. PHP is easy and preferred to use with HTML language. Cascading Style Sheets (CSS) is used to style the web pages, it is used with HTML to improve the presentation of the websites. It allows could be considered as a control of web pages, CSS have the ability to convert the website into the user-friendly website. Ruby is a general-purpose, object-oriented, reflected and dynamic web programming language. It is used by different web developers to create user-friendly and effective interfaces. It is considered as the best programming language for the beginners because it is easy to learn. Perl stands for Practical Extraction and Report Language, it is recommended to the full stack developers for text processing. The ability of Perl to manage texts systems makes it a great tool in web development. SQL stands for Structured Query Language, it is a used to communicate with the databases because it is a special purpose programming language that enables to access and manage the data in Oracle, MySQL, and many other databases. SQL retrieve large amounts of records from a database efficiently.